A small team met at Stobo Kirk on Saturday 8th May to record the Monumental Inscriptions in the churchyard. It was a very cold day but we managed to record all of the older stones in front of the kirk. We met again on Sunday afternoon, a much warmer and very beautiful Spring day. Recording of the newer stones behind the church was completed and all stones were photographed. There are several very interesting symbolic stones which are still in excellent condition, a testament to the skills of the 18th century stonemasons. 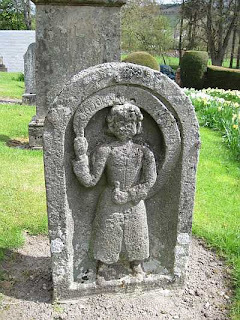 Stones include those of William Hogg, brother of James Hogg, the Ettrick shepherd. 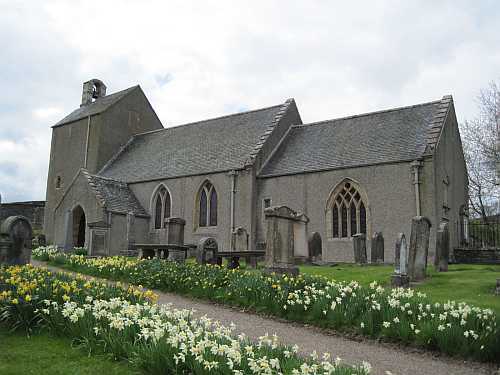 The church is one of the oldest in the Borders, sitting in the Tweed valley to the west of Peebles. Interesting features in the church include the jougs, still hanging at the front door, the most public of places for public repentance, or civil punishment. There are grooves cut into the stone walls at the front door, reputedly carved by archers, sharpening their arrows in readiness for their archery practice following the battle of Flodden. Stobo kirk is situated in the village of Stobo on the B712 off the A92 (signposted Broughton) approximately 6 miles south west of Peebles. See this map for directions. If you are in the area, Stobo kirk is worth a visit.